Car shoppers are turning to crossover SUVs now more than ever before, and with the majority of crossovers offering an impressive fuel economy rating, plenty of interior space, and high-tech standard features, it’s not hard to see why. If you’re looking for a vehicle that easily fits five adults and has a generous amount of cargo space, you’re going to want to keep an eye on the 2017 Honda HR-V? We know how difficult it can be to find information comparing similar makes and models, so we’re putting the 2017 Honda HR-V to the test with a head-to-head comparison against one of its rivals: the 2017 Jeep Renegade. Read on for an in-depth look at the features and specifications offered by both vehicles! The 2017 Jeep Renegade comes in six trim levels: Sport, Latitude, Altitude, Limited, Trailhawk®, and Desert Hawk®. Two engine options are available: a 1.4-liter MultiAir® turbocharged 4-cylinder that delivers 160 horsepower and 184 pound-feet of torque and a 2.4-liter MultiAir® 4-cylinder that makes 180 horsepower and 175 pound-feet of torque. The base trim features somewhat scarce standard equipment, notably missing air conditioning, cruise control, a rearview camera, and an infotainment system. 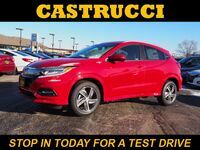 Standard safety features for all trim levels include Anti-Lock 4-Wheel Disc Brakes, Electronic Roll Mitigation, Electronic Stability Control, the Latch System, Panic Brake Assist and Tire Pressure Monitoring Display. 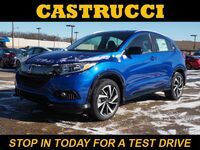 The 2017 Honda HR-V comes in three trim levels: LX, EX and EX-L with Navigation. All trims come standard with a 1.8-liter inline 4-cylinder engine that generates 141 horsepower and 127 pound-feet of torque. The LX and EX trims both come standard with a manual transmission, but drivers are able to opt for an automatic transmission instead, and the EX-L with Navigation trim comes standard with a Continuously Variable Transmission with Sport Mode. The base trim comes standard with more features than the 2017 Jeep Renegade, adding on standard cruise control, air conditioning, a rearview camera, and a 5-inch LCD screen display. Standard safety features for all trim levels include Vehicle Stability Assist with Traction Control™, the Anti-Lock Braking System, Electronic Brake Distribution, Brake Assist, the Tire Pressure Monitoring System, Advanced Compatibility Engineering™, side curtain airbags with a rollover sensor, 3-point seatbelts for all seating positions, and the LATCH System. 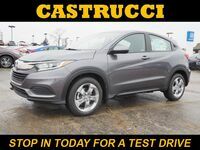 Drivers interested in getting behind the wheel of the 2017 Honda HR-V for an obligation-free test drive are encouraged to schedule a test drive appointment at Matt Castrucci Honda online today! Have additional questions about the 2017 HR-V before getting in the driver’s seat? No problem! Contact a member of our team, and we’ll be able to answer any questions you may have!